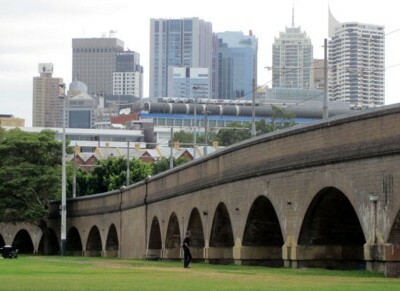 Created in 1882 as a grand Victorian park, Wentworth Park links Glebe to the Fish Market. When you emerge from the park onto Bridge Road you will find access to the Glebe Light Rail station to your right. Opposite you across Bridge Road you will see the Art Deco Kauri Hotel(1934), named after the famous New Zealand softwood, and originally a timber workers’ pub. Across Wentworth Park Road is Wentworth Park, created from Blackwattle swamp in 1880-82 (James Jones) and named after the Father of Representative Government in NSW, W.C.Wentworth. It predated Centennial Park, and was once elaborately landscaped. It was the site of the first Rugby League match in 1908 (another match was held on the same day at Birchgrove) and was the first home of Glebe Cricket Club. After various vicissitudes dog races began there in 1932, and it became an American depot during WWII. The double row of Moreton Bay Figs alongside Bridge Road dates from 1890 or the early 1900s. It is a typical example of the landscaping style of that period for parkland in Sydney. Centennial Parklands and Moore Park are other examples from the period. It is pleasant to walk along this avenue towards the Fish Markets.